The California Cotton Ginners and Growers Association, represented by President/CEO Roger Isom, Chris McGlothlin, Director of Technical Services, and Jodi Raley, Director of Regulatory Affairs, ventured to San Diego to take part in a unique opportunity for the cotton industry to give back to those who have served our country. Senate Pro Tem Toni Atkins represents the 39th Senate District, which includes La Jolla, Del Mar, Downtown San Diego, Point Loma and other surrounding communities. With Point Loma Naval Base and the San Diego Marine Base within her district’s bounds, there is a large population of veterans, some of which who are struggling. CCGGA learned earlier this year that Pro Tem Atkins was passionate about assisting these veterans and hosts on an annual basis a Stand Down event in her district. Stand Down events offer food, shelter, clothing, health screenings and other services to homeless veterans. One of the most requested items for these events is, of all things, socks. Once CCGGA learned of this event and the high demand for good quality socks for these veterans, we started thinking on how we as a fiber industry can contribute to this cause. 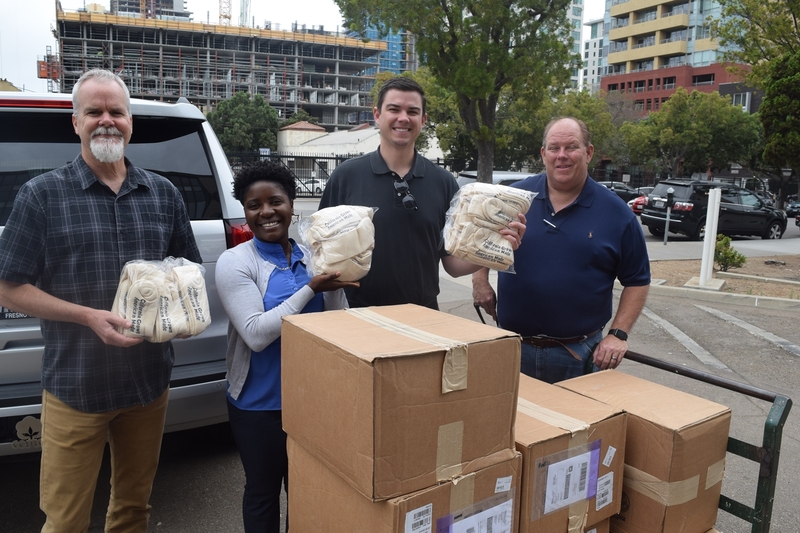 In partnership with Supima, CCGGA was able to donate 1,000 pairs of California Grown, American Made pima cotton socks. The socks will be distributed at San Diego’s 31st Annual Stand Down taking place June 29th through July 1st. The Association was honored to be able to use our grower’s cotton to be put forward towards a great cause. CCGGA looks forward to continuing this momentum and finding additional opportunities to give back as an industry. CCGGA would like to extend our sincere appreciation and thanks to Supima and Harris & Covington Hosiery Mills for partnering with the Association to make this happen! This entry was posted in NEWS & ISSUES on June 25, 2018 by ccgga.